Ousmane Dembele: The Next French Phenomenon? As the Ligue 1 season winds down, storylines are starting to slowly dwindle down to a core trio: the race for the last Champions League spot is still as tight as when we last covered it (disclaimer: Finishing in the 3rd CL spot in Ligue 1 currently means you have to go through two playoff rounds to get to the group stage. No Ligue 1 team has made it past two rounds of CL qualifying since this started happening in 2013-14), PSG are staking their claim as possibly the greatest Ligue 1 squad ever, and Ligue 1’s poor showing in the Europa League has their coefficient dangerously teetering towards losing their 3rd CL spot. Rennes are one of those teams that in theory have enough talent to finish in the top three. For a Ligue 1 side, they’re isn’t a shortage of attacking options. Paul-Georges Ntep hasn’t progressed quite as much as some had hoped for a variety of reasons but he’s only 23 and has high upside. The dream of Yoann Gourcuff recapturing what he once had at Bordeaux is dead but he’s still a decent player when healthy while Juan Quintero has put up decent creation numbers in only ~800 minutes this season. Despite the squad at hand, their attacking numbers range from mediocre to bad which could be a product of having substandard managing. Perhaps the most shocking thing with Rennes this season is there’s a good argument to be had that none of those players I mentioned are Rennes’ best player. Ligue 1 is known for producing great talent through their academies and Ousmane Dembele could be the next one to add to that list. 1124 minutes is a small sample and it would be rash to make steadfast proclamations. Trying to project the ability of a player to blend into a different league is also tough to contextualize. Ligue 1 is notorious for being slower paced and though this season there have been numerous former Ligue 1 players who have transitioned well into the PL, you still can’t really know. For every Dimitri Payet, there’s a Florian Thauvin. For every Max Gradel, there’s a Remy Cabella. Having said all that, you can’t help but get excited at the potential Dembele’s got. I could only find 2-3 matches featuring Dembele that were of significant length so I can’t come up with a definitive scouting report on him but from what I’ve seen of him, he’s quite possibly the best dribbler in Ligue 1. There was this sequence versus Caen last week that would’ve been the goal of the season. I could name maybe four other players in France who could pull off that sequence of events. Dembele is averaging 5.5 completed dribbles per 90 this season. That’s not a misprint. It’s an absurd number that actually puts him ahead of everyone in Europe who’s played at least 1000 minutes this season. Higher than Neymar, Messi, Hazard, Lucas Moura. All the usual suspects you would assume to be #1 are behind Dembele. At just 18 years old, he’s producing offense at a rate that’s quite rare. With at least 1000 league minutes played in an attacking position this season, there’s only two other players in the top five leagues under the age of 20 who have a shot contribution per 90 rate of at least four: Dele Alli and Timo Werner. That’s it, and you could even argue that what Dembele is doing is even more impressive because both Tottenham and Stuttgart are healthy shot generating teams while Rennes are almost the opposite. If we look historically at U20 players in the top five leagues, the list is really short. 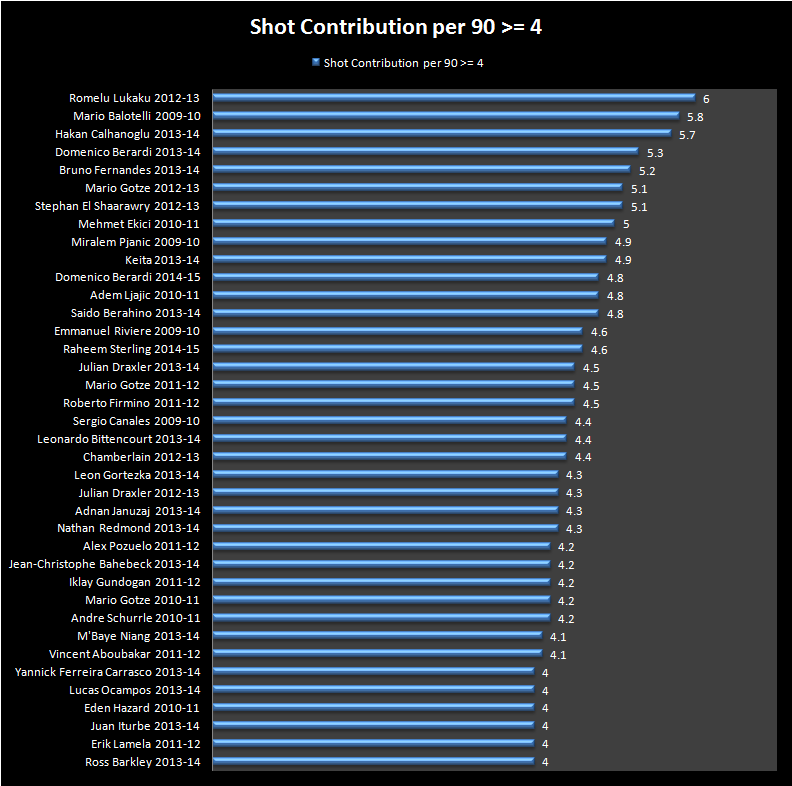 Using the same criteria and extending it from 2009-15, I found 39 players that have contributed at least 4 shots per 90. Some of the results were really interesting. Look at that list and it’s got a good amount of star talent. Lukaku should morph into a top five striker in a couple of years. Sterling has probably plateaued since 2013-14 but he still has massive potential. Mario Gotze’s career has also stalled over the last two seasons but he was one of the highest rated young players when he was with Dortmund while Lamela and Carrasco are very solid wingers. There’s some duds in this list: Lucas Ocampos and Juan Iturbe look like potential lost causes, Oxlade-Chamberlain and Riviere are probably going to grade out as decent rotation players, novels could be written about Balotelli’s career and both Januzaj and Berahino have struggled for various reasons after bright debut seasons. Even then though, you look up and down this list and more players have turned out to be solid contributors than they have busts. And again, this kid won’t turn 19 until the middle of May and his production would rank right around the upper tier which is insane. I wish I could take credit for the following comparison but I sadly can’t. I recorded a podcast with Julien Assuncao and he said that Ousmane Dembele was this season’s Clinton N’Jie; a fast paced winger who puts up promising offensive numbers in his first season in Ligue 1. I wrote about N’Jie last season and I was high on him even with his deficiencies and numbers being boosted by substitute effects because his pace and ability to get shots from good locations was really good. He obviously hasn’t had the same success for Tottenham so far because of injury but I still think he could be a quality LW/SS in the EPL. The scary thing with Dembele is he’s nearly four years younger than N’Jie and having a season that’s pretty much on par but without the benefit of playing with the likes of Nabil Fekir and Alexandre Lacazette. As always with a Ligue 1 player, the question will turn towards when will he move on for greener pastures. In theory, Dembele has some of the physical attributes to already make the jump to a higher quality league. He is the best dribbler in Ligue 1 and even with a jump in quality of opposition, he should still be able to get past defenders regularly. Despite being at times the focal point for Rennes, his dispossession numbers are actually quite respectable and i’d probably say that you could make a very convincing argument that he’s a more rounded player than N’Jie was when he left for Tottenham. But just like N’Jie, I think it would be best if he stayed in Ligue 1 for another season or two. I’m the furthest thing from a qualified trainer, but it could be in his best interest to put on a little bit of strength to combat stronger defenders and the odd dirty challenge. Rennes are one of the few clubs in Ligue 1 with a little bit of money to play with and finishing 3rd in Ligue 1 would mean that the faint hopes of qualifying for the CL group stage would lead to Rennes upgrading the squad around him so he isn’t compelled to leave. More than anything, he gets to be a main contributor on a decent team at a very young age which is something I highly doubt he’d get to experience if he went abroad. Say he followed his fellow compatriots and went to the PL, who in hell is prepared to have a 19 year old winger be a huge part of their side immediately while vying for Europe? Southampton is the only team I could somewhat see doing this just because they could be on the lookout for a Sadio Mane replacement and maybe their black box has Dembele as a transfer target. 1124 minutes does not make a career and being compared to a young Cristiano Ronaldo won’t help with calming down expectations for a teenager. In Dembele’s case though, it would be pretty surprising if he didn’t turn out to be a very good player. His production is right up there with most U20 players and he’s younger than anyone in that group. There isn’t much divergence between his statistical value and visually. Dele Alli is the only guy out there producing at a comparable clip to Dembele, and he’s doing it in a system that’s much more advantageous to racking up shot contribution numbers. Calling a player a phenomenon nine times out of ten is a fairly hyperbolic statement, but there’s the chance that Ousmane Dembele is the 1/10 scenario that actually lives up to the hype.